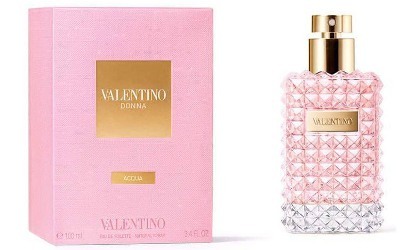 Valentino has launched Valentino Donna Acqua, a new fragrance for women. Valentino Donna Acqua is a flanker to 2015's Valentino Donna. Valentino Donna Acqua is presented in the iconic studded glass bottle, signifiers of defiant grace, while the outer packaging is resonant with that of the classic Valentino Donna fragrance. An irreverent clash of lightness and indulgence composed by Sonia Constant, this indulgent composition is a collision between almond and frosted pear. Additional notes include rice accord, frangipani, jasmine, hawthorn, roasted tonka, benzoin and sandalwood. Valentino Donna Acqua is available now at Selfridges in the UK, in 50 and 100 ml Eau de Toilette. Doesn’t strike me as an “aqua” but the copy makes me strike myself in the head with my palm. Notes look interesting. There was a hair mist that came out last year. I am waiting for it or the EDP to go under $50 before pulling the trigger. And they’re sure to get below $50 eventually!